Stopping by the local farmers' market on the way home from my Friday morning yoga class is a welcome addition to my routine. I just throw the market basket I purchased when we were stationed in Germany into the car along with my yoga bag. My husband always thought that my system of finding recipes, making a shopping list, and then shopping for groceries was backwards. He wished I would buy what’s fresh and reasonably priced first, choose recipes from there, and then go back to the store for whatever little things I needed to fill in the gaps. For me, that was one shopping trip too many, but it can work if I pick up produce on Friday and then do the shopping for the other stuff on the weekend. Besides, shopping at the farmers' market is a fun errand. I always like to see what’s new and fresh. Last week, the round zucchini in several different colors caught my eye. Trying to figure out the names of the different varieties has proven to be a challenge. The Long Island Seed Project suggests that the dark green is the Tondo di Piacenza from Italy and the light green is the Ronde de Nice from France. But based on what I saw from Burpee Seeds and Plants, it might just be safer to call them all a Ball Hybrid Mix. Trying to find a vegan option for stuffed zucchini proved challenging as well. It seems like everybody likes to stuff their veggies with meat and cheese. I decided to use this recipe for Couscous-Stuffed Globe Zucchini as a starting point, and just leave out the feta, but I ended up making a few other changes along the way. I wanted something satisfying that was going to have good flavor and texture. I was a little bit concerned about all of the salt in this recipe, and I’m a salt fan. But the original instructions were spot on. These were seasoned really well, and really satisfied that salt craving that I always seem to have. This turned out to be a beautiful and delicious dish. If you avoid wheat, you could always make this with quinoa, but I really enjoyed the texture of the barley. My husband and I ate five of these for our dinner, and I happily had one leftover for part of my lunch the next day. Just add some side dishes if you need this recipe to feed more people. If you can’t find round zucchini, just use the traditional long variety. Cook the barley according to the package instructions. Quick-cooking will take 10-15 minutes while regular will take 45-50 minutes. Slice the tops off of the zucchini. Carefully scoop out the flesh using a melon-baller or a spoon, leaving 1/4-inch border on all sides. Finely chop the zucchini flesh that you removed. Add the garlic, and sautéfor about a minute, stirring frequently so it doesn’t overcook. Add the finely chopped zucchini to the pan and cook uncovered for about 10 minutes. Add the bell pepper, and sautéfor about 10 more minutes until vegetables are soft and most of the water has cooked off. Meanwhile, brush the outsides of the hollowed out zucchini with olive oil, and generously sprinkle the insides with salt. When the zucchini/pepper mixture is finished, add in the cooked barley, chickpeas, parsley, salt, and pepper. Scoop this mixture into the zucchini shells and place onto the prepared cookie sheet. Cover the cookie sheet with foil, and bake zucchini for 30 minutes. Meanwhile, in a small bowl, combine the breadcrumbs, extra virgin olive oil, parsley, and salt. When the zucchini have finished baking, remove the top layer of foil, sprinkle the bread crumb mixture over the top of each zucchini, and bake uncovered for 10 more minutes or until the breadcrumbs turn golden brown. 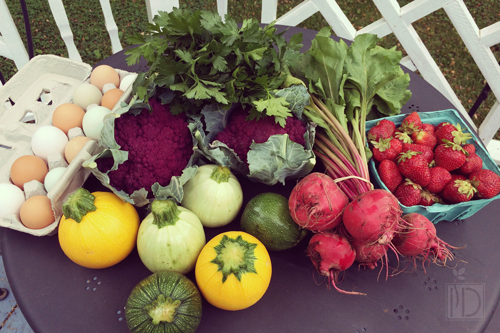 What have you been loving at the farmers’ markets lately?